The ability to sign in to Windows operating system with a Microsoft account has been available since the release of Windows 8 and the feature is present in Windows 10 as well. 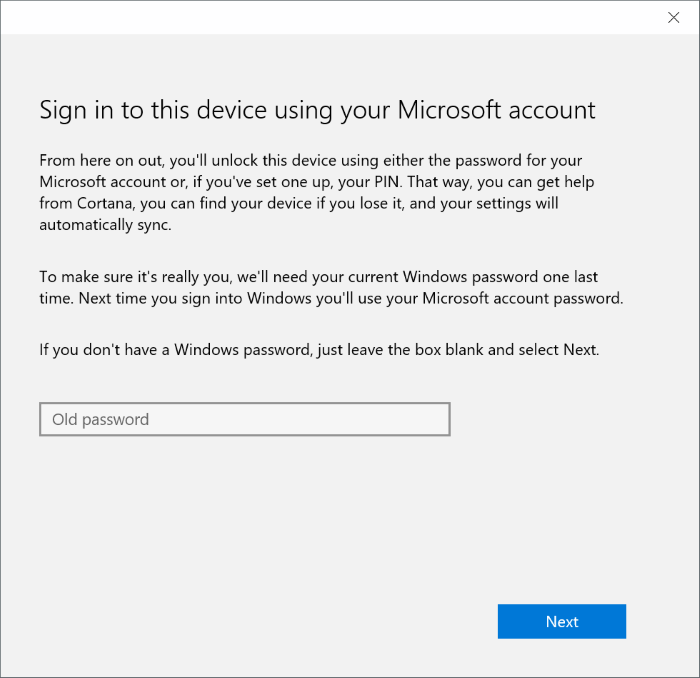 While the Windows setup tries its best to make users use a Microsoft account to sign in, it’s possible to install and use Windows 10 with a local user account. The other day, a user asked us if it’s possible to use a Gmail account as Microsoft account to sign in to Windows 10 instead of creating a new Outlook.com email ID? It’s fairly common for people to assume that a Microsoft account means nothing but a valid email address from MSN.com, Outlook.com, Hotmail.com or Live.com. While this true, if you never used a Microsoft service before this and have a valid Gmail, Yahoo! Mail, iCloud or any other email address, you can use that non-Microsoft email address to create your Microsoft account. One can use a Gmail, Yahoo! Mail or any other email address to create a Microsoft account without actually signing up for Outlook.com service. That said, you won’t be able to directly use your Gmail or Yahoo! Mail as your Microsoft account but you will be able to create a Microsoft account using your Gmail or Yahoo! Mail. 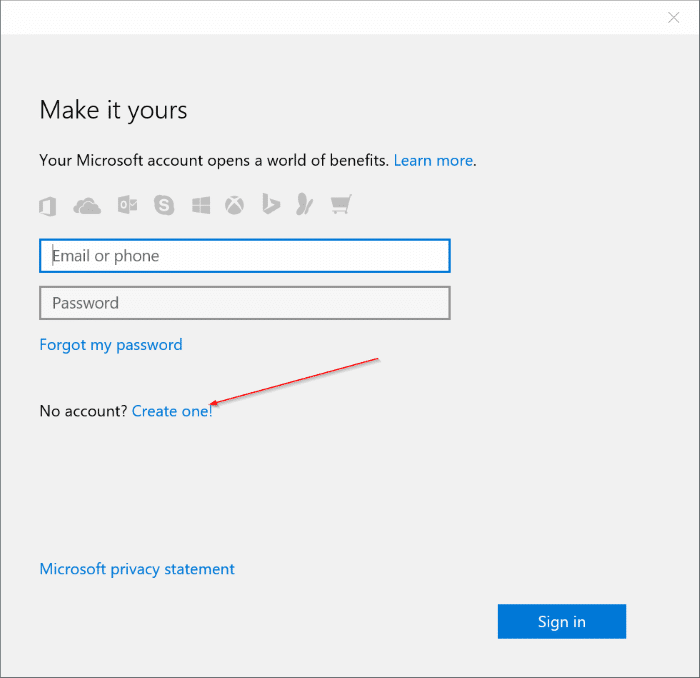 When you use a non-Microsoft email address to create Microsoft account, you will be able to use that non-Microsoft ID to sign in to Microsoft services and products without actually creating a new email ID. That is, for instance, if you use your Gmail address to create Microsoft account on Windows 10, you will be able to use your Gmail address to sign in to Windows 10. If you’re confused, let me explain how this works. When you create a Microsoft account using Gmail, Yahoo! Mail or AOL Mail address, you will be able to use your Gmail, Yahoo, iCloud or AOL email address to sign in to your Windows 10 PC (no new email address is created) by entering your Gmail, Yahoo or AOL address along with the password which you assigned while creating your Microsoft account. 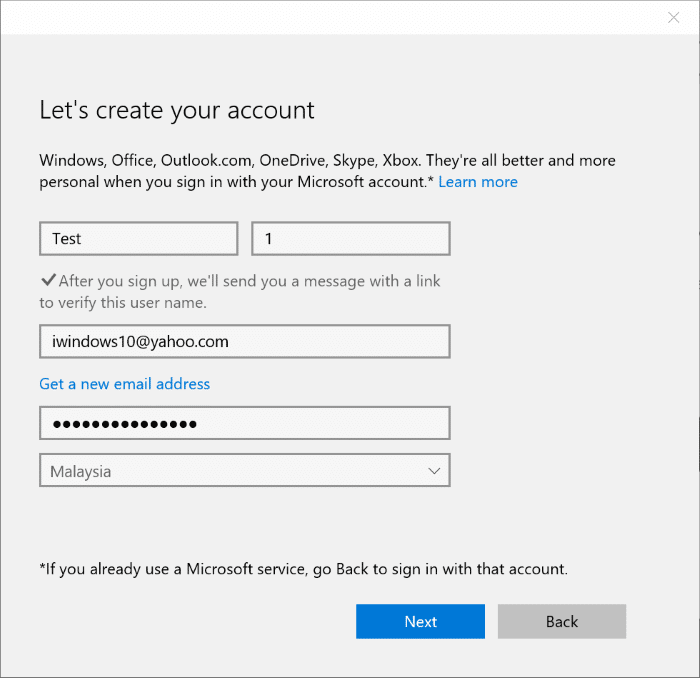 In simple words, when you create a Microsoft account using a non-Microsoft email address, your current non-Microsoft email ID works as Microsoft account ID, and you can use the same to sign in to Windows 10. For instance, if your Gmail ID is 123@Gmail.com, you can use this same email ID and the password which you had created while creating Microsoft account to sign in to Windows 10 after creating your Microsoft account. When you create a Microsoft account using Gmail, Yahoo! or any other non-Microsoft email address, you get all the features available to Outlook.com or Microsoft account users. That is, you get about 15 GB of free space on OneDrive, you can access the web version of Office, and chat with your contacts using Skype. NOTE: Since you don’t have a Microsoft account yet, we assume that you’ve signed into Windows 10 using a local account. Step 1: Open the Start menu. Click on the user account name (located top-left) and then click Change account settings. 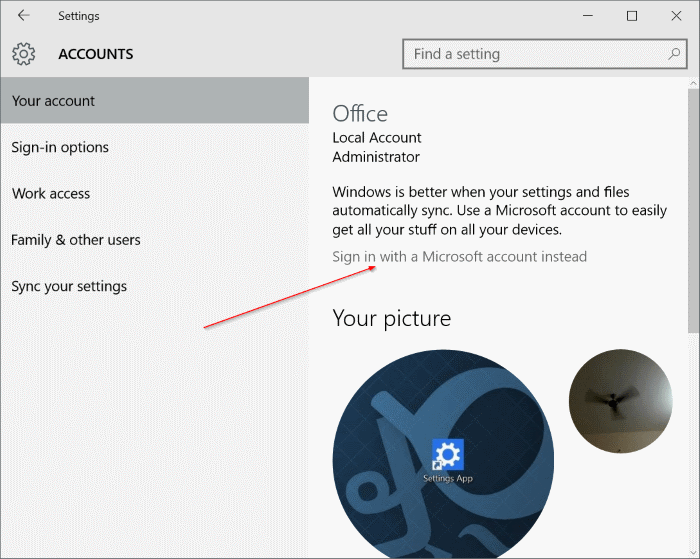 Step 2: Here, click the link labelled Sign in with a Microsoft account instead. Step 3: You are here because you don’t have a Microsoft account yet. So, to create one, click Create one link. Step 4: You will see the following dialog where you need to enter your Gmail, Yahoo or any other email address, your name, birth month, your country and other details. Please don’t click the Get a new email address as clicking this link will open a new dialog to sign up for a new Microsoft account by creating a new Outlook.com email address. Step 5: Next, you will see the following screen. 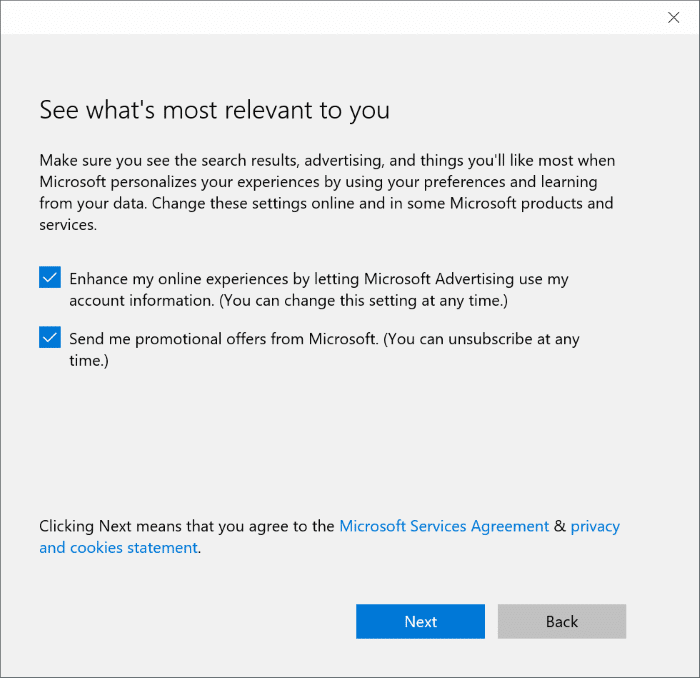 As you can see, by default, Microsoft uses your account information to enhance your online experience and sends promotional offers. If you aren’t interested in these, uncheck them before clicking Next. Step 6: You will be asked to enter your local user account. Enter the password or leave the field blank if you haven’t set up a password for your account yet and then click Next. 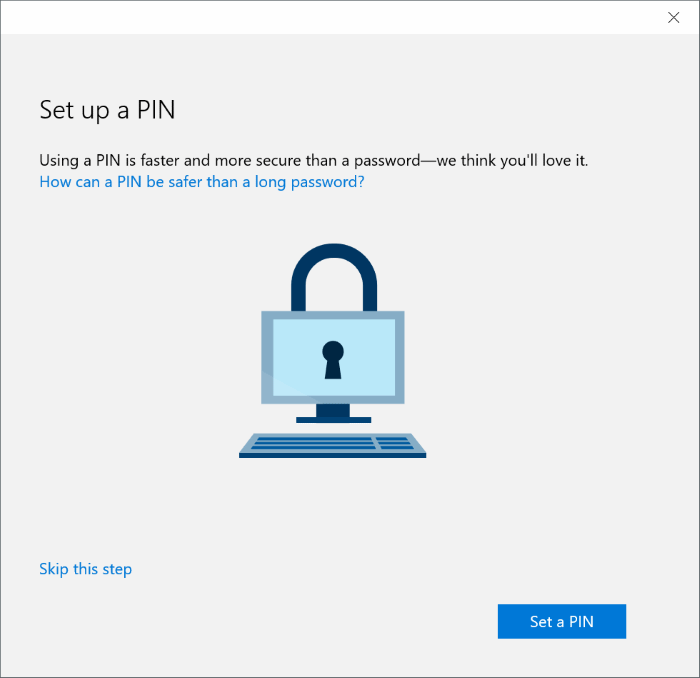 Step 7: On the Set up a PIN screen, click Skip this step if you would like to use your password instead of creating a new PIN to sign into Windows 10. And if you would like to sign in using PIN, click Set a PIN and then follow easy on-screen instructions. Once done, you will see the following screen. From here on, you need to enter your Microsoft account password to sign into Windows 10. That’s it! You just created a Microsoft account using your non-Microsoft email ID. You can now head over to Outlook.com and sign in to your Microsoft account using the non-Microsoft email ID which you used to create a Microsoft account. I made an microsoft account using gmail address and using that miscrosoft account i logged into outlook webmail but i’m unable to recieve and send email from outlook webmail that was logged in but a microsoft address having postfix gmail.com as i mentioned above that microsoft account was made using gmail address and i tried to send email from gmail to outlook. If i used gmail.com i receive email on gmail and if i put outlook.com ispite of gmail.com then it comes up with an error “address not found”. here I want to tell you that microsoft account is working properly in my laptop. How have I never known this! This baffles me as now I have a googlemail account and an outlook account but if I’m correct they both receive the same emails? So does any changes I make on one apply to the other, for example if I delete an email using googlemail.com will it automatically delete it when I look on outlook.com? But thank you for your helpful article. It cleared some questions up that I had after speaking with someone from Microsoft about sharing my Office subscription with a family member, but without them being able to see my personal OneDrive or Outlook account etc. They said I have to associate the family member’s googlemail account with Microsoft and I just couldn’t understand what they meant… So thanks!